Drone World’s newest Phantom 4 Executive Bundle is already a bestseller. After months of testing the Phantom 4 and years of modifying DJI systems, it’s with anticipation that Drone World announces the Phantom 4 Executive Kit. The kit is a fully loaded bundle that includes the Phantom 4 quadcopter plus premium upgrades, such as the recently leaked ‘fully internalized’ remote control signal booster. Drone World started shipments of the DJI Phantom 4 drone on April 1, but prepared its Executive Kit months before. 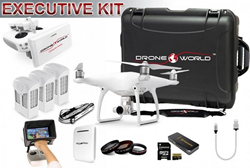 The company’s previous Phantom 3 Executive Kit was a bestseller across the nation. And it was that Phantom 3 Executive Kit that set the benchmark for premium DJI Phantom kits. Each Phantom 4 Executive Kit includes a free mini-drone, normally priced at $29. Drone World offers multiple upgrades, as well, including accident insurance, pre-installed Phantom 4 firmware, specialized Phantom 4 FPV goggles plus HDMI module (with installation), GPS tracker, a 64 GB MicroSDHC memory card with USB 3.0 reader, and a military-grade backpack. About Drone World: http://www.Drone-World.com is the Web’s preferred destination for consumer and professional unmanned aerial drones, drone kits, and drone accessories. Drone-World.com combines superior customer service and know-how with over 5 years of drone experience and 10 years of web sales and service. They specialize in custom DJI Phantom bundle kits, including the highly popular DJI Phantom 3 kit, the OSMO kit, the Inspire 1 kit, and the newly released DJI Phantom 4 kit and DJI Phantom 4 bundle.